Sandwiched together with Cliff View and Otherside bungalows, Banana Bungalows shares the same basic bungalow design and style as its neighbours. Ad Book now! Rates from US$23.8++. Average rating 7.1 from 261 reviews. All bungalows have the same rate regardless of location and come with an attached bathroom with hot water shower, decent bed, balcony and hammock. The older rooms line the river and have the view but they are built closer together and the interiors have seen better days. The newer bungalows at the back are more spacious and solid, with a view to the mountains and enough space between each to give you privacy. Big windows with screens mean plenty of natural light, fresh air and no insects. A minifridge doubles as a bedside table and there’s optional air-con. For your money, you get plenty of bamboo on the walls and an earthy feel. 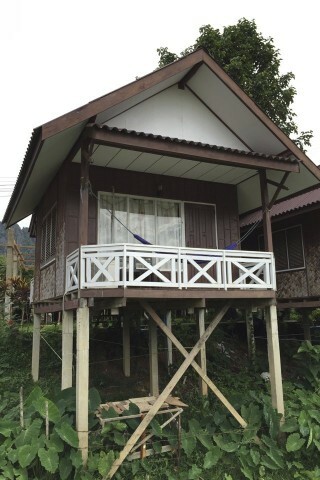 Check rates at Banana Bungalows on Booking.com.